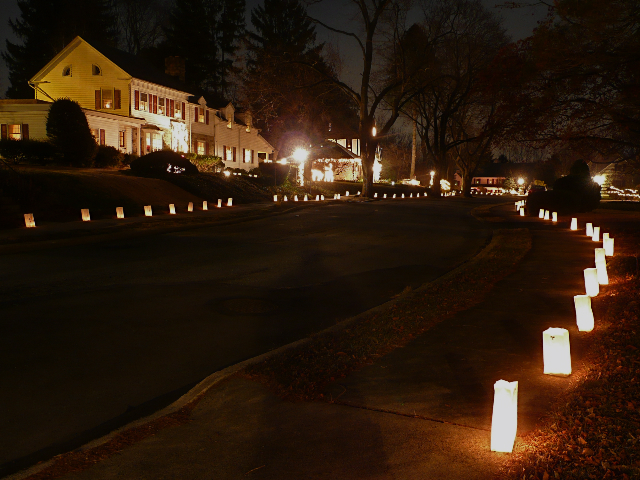 The Rose Garden Neighborhood Association will once again "light up the night" with luminaria along the City’s West End sidewalks on Saturday, December 14th for a glowing holiday display for all to enjoy. The moon will be three-quarters full, adding special ambiance to the evening as you stroll about, perhaps stopping by a friendly porch to meet your neighbors along the way while taking in the crisp night air. Hope you’ll join us in lighting up your sidewalk for what promises to be a memorable evening display! Date: Saturday, December 14, 2012 - start candles burning at 5p.m. (1) White lunch bags: 6"x 4"x 12 " (or next smaller size) - bags available selected supermarkets. (3) Space bags 5 feet apart along the inner edge of the City sidewalk in front of your home. - our previous candle supplier, A-1 Restaurant Supply at 16th St. and Sumner Avenue, is under new ownership and may no longer carry the long-burning votives, so finding these may be challenging, but please do your best and if you find a source, let the neighborhood know by sending the info to info@rosegarden-na.org – thank you! (5) Allow enough time (at least 1 hr.) to set-up your luminaria to begin burning by 5 p.m.! To download the above information please click below.